Friday was the 4th of July, as I’m sure everyone is fully aware of…haha. A couple months ago I had done a google search to see if I could find a 5 or 10K to run for the 4th. Found one right off the bat…the Freedom 5000. I went to the website and checked it out, but since the race was on a Friday and I work on Thursdays, I wasn’t sure how packet pick up was going to be. I mean, was I going to be able to pick it up before work on Thursday? Would pick up be near my work and I could go on my 20 minute lunch break? Would they have morning of pick up if neither of those 2 options were available? Well, turns out the answer to all 3 questions was yes. I opted to pick up my packet before work on Thursday. The pickup was at Luke’s Locker and I found a pair of tights I want. But they’re $76. But…I do have a $10 off coupon (if it’s not expired, of course), so that would make them $66. Still pricey, but not quite as ridiculously pricey. And they are awesome tights. 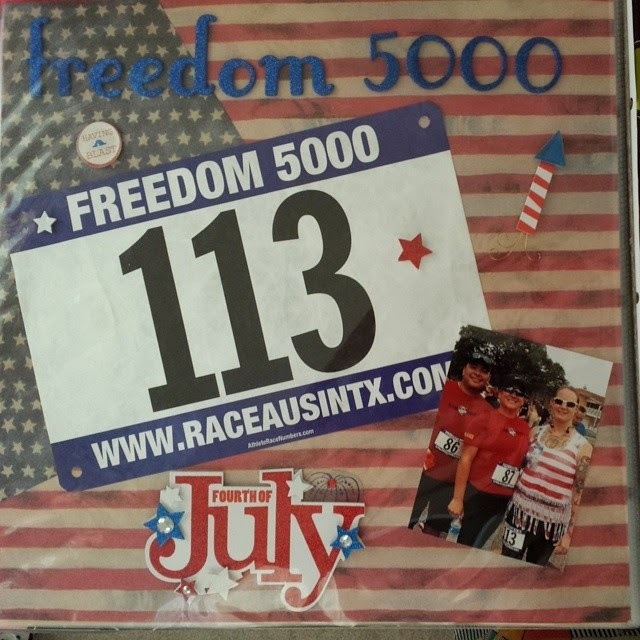 The packet consisted of a race specific bib (he had “Freedom 5000” printed on it…YAY!). I LOVE bibs that have the race name on them. I’m not a fan of generic race bibs at all. I’m of the mind that I’m paying decent money for the privilege to run this race, I should get a pretty bib that is also commemorative. And, my last 2 bibs (this one and the one for the Helvetia Half) were both commemorative. I have a bit of a hitch in my scrapbooking giddy up (I’m talking about my race scrapbook). I like to buy at least one official race photo (or, if they’re free downloads, then I’ll download them). If I buy the photo, I’ll scan it into my computer and print it out in wallet size. They usually come in a 5x7 which is far too big for a scrapbook page photo (for the way I do my pages, anyway). Well, when I went on my roadtrip last month, I took my scanner/printer with me. I didn’t actually use it like I had meant to. So, it was disconnected from my wifi network and my computer for 2 weeks. Well, now it doesn’t want to work. I try to print something and I get an error message saying the printer is offline. I tried reinstalling the software and it’ll print the test page, but then I try to print something else and it says it’s offline. So, until I get around to calling customer support to fix the problem, I can’t scan pictures or print anything. So, what I did was take a picture of my Helvetia official photo with my phone and email it to myself, then I put it together with another race photo so that they could be printed out on a 4x6 and I can just cut it in half and have 2 photos the size I want. Only problem with that is that when you print out a digital photo at the photo shop, you can tell it’s digital. So, I’m not going to glue them into my scrapbook just yet. I’m going to try to remember to call Canon Monday morning and see if I can’t get my printer back online. BUT! I did get some things accomplished with my race scrapbook. For my Helvetia Half and Freedom 5000 pages, I wanted to splice together a couple different pages to make 2 unique background pages. For Helvetia page, I took a red page and then a yellow page (those were the colors of the race) and I cut the yellow page into rays (like sun rays) and glued them onto the red page. For the Freedom 5000 page I had bought a red and white striped page and a blue with white stars page (both vintage looking, so slightly weathered looking) with the intent of making a custom abstract flag page, which I succeeded in doing. Alright…back to the race itself. Haha. I woke up at 6am and snoozed until 6:20. I got up and got dressed. I wore a fringed flag shirt, 80’s style! I opted not to wear my usual headband as it really wasn’t hot out and it wasn’t humid and it was only a 5K. 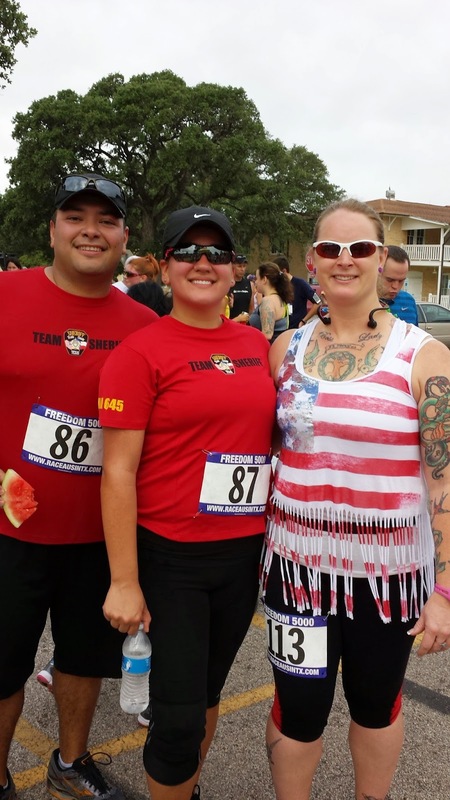 I stopped at Einstein Bros Bagels on the way and got a chocolate chip bagel and a strawberry-banana smoothie for my pre-race “meal.” I then made my way to Camp Mabry. When I arrived, it was sort of arriving “late” so I didn’t get super close up parking and had to walk a little over ¼ mile to the starting area. There was a food truck there serving coffee, however, it was not free. And I didn’t have my debit card or any cash with me…left all that in the car. So, no coffee for me. I had noticed when I was looking at my bib that there was no timing chip attached to it so I was thinking the race wasn’t going to be officially timed, but as I was walking up to the start area I noticed the trailer for a timing company. Sure enough, at the table for morning of race packet pick up there was timing chip pickup as well. It’s the kind that straps around your ankle an velcros to itself. It chaffed a bit by the time I crossed the finish line. Right before we started, some of the military personnel left in some of the historical military vehicles in period costumes to go be part of a parade. We all clapped and cheered as they drove by. Then we could start. YAY! It wasn’t a live person singing the anthem, but a recording of a male acapella group singing it. The first (well, the ONLY) water stop was right at the 1 mile mark. I grabbed some water and walked for just a short bit. The turnaround was pretty much exactly at the 2.5 mile mark. When I was coming back up to the water stop and realized it was going to be right at the 3 mile mark, I knew the course wasn’t a full 5K. Phooey. I finished the 2.95 mile run in 30:56 minutes, per my Garmin. There were no official photos. Thankfully, 2 of my friends, Pam and Eddie had also run the race! SO, I asked this guy standing nearby if he wouldn’t mind taking a pic of the 3 of us and he happily obliged. Since there were no official photos taken, that’s my “official” photo for this race that I will glue in my scrapbook. Overall, I was very happy with this race and I want to do it again next year. I think the page looks cool!